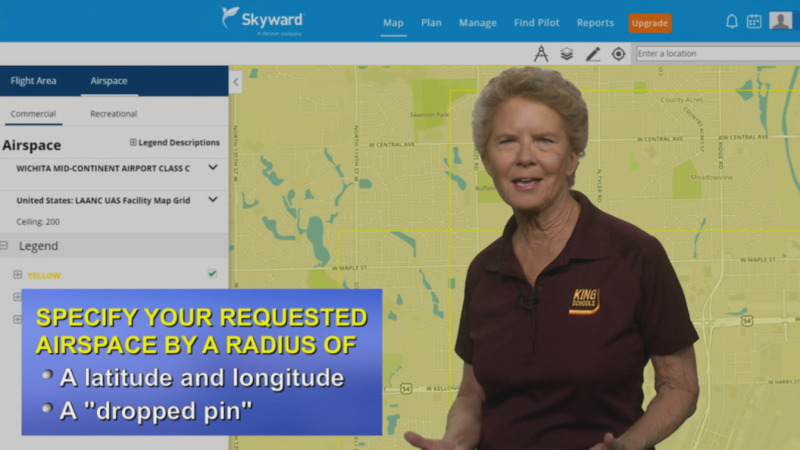 Martha King is the Instructor in this free course that explains how LAANC enables drone pilots to access controlled airspace near airports through near real-time processing of airspace authorizations. September 17, 2018 San Diego, CA Drone pilots can take a new free King Schools course titled Using LAANC to Fly Drones in Controlled Airspace to learn how to use the FAA Low Altitude Authorization and Notification Capability. The online course includes HD video and bullet points followed by interactive questions to test your knowledge. Low Altitude Authorization and Notification Capability, pronounced “LANCE,” is the result of a partnership effort between the FAA and private industry. LAANC enables drone pilots to access controlled airspace near airports through near real-time processing of airspace authorizations. In this course, Co-Chairman of King Schools Martha King explains how operators of drones can get that authorization. The LAANC course is available for FREE at KingSchools.com/LAANC. This entry was posted in Blog & Stories, King News, King Press Releases on September 17, 2018 by Pilot One.